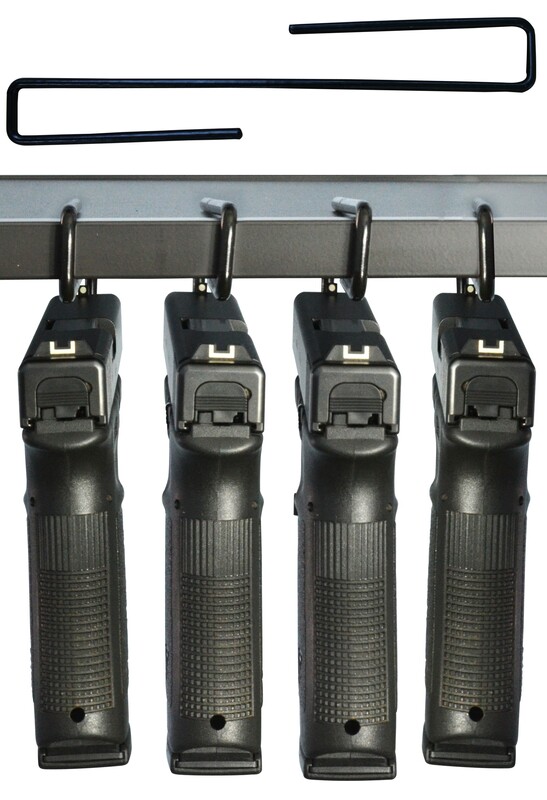 This Boomstick Gun Accessories 4 pack of under shelf handgun hangers is the perfect way to store your precious weaponry in what would otherwise be wasted space! Simply slide the hanger on a solid surface such as a shelf or desktop and then slide the barrel on the end sticking out toward you and you are set! No drilling or complicated assembly needed, it's as easy as it gets! Sturdy vinyl coated metal means your guns finish is protected while not in use. Each hanger is designed to work with .22 caliber handguns and up that are overall less than 10 inches in length. Hangers will fit a shelf or desktop that is 5/8 to 1 inch in thickness. Pack of four hangers. Each hanger measures 10 x 2 x .2"